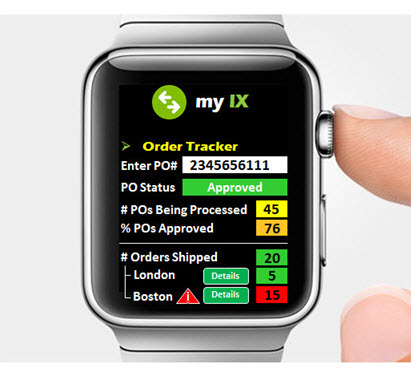 Will Apple’s Watch Transform How Companies Interact With Their Supply Chains? If there was one company that has contributed the most towards mobilizing today’s enterprise, from a smart device point of view, I would have to say it is Apple. Interestingly Apple has been able to achieve this with hardly any dollars being spent on enterprise marketing activities, instead, the trend of allowing employees to connect their own devices to corporate resources has allowed Apple to effectively own the Bring Your Own Device, BYOD, market. BYOD has transformed how employees engage with corporate resources and it has also driven the need, in Apple’s case, for the development of IOS specific apps to integrate to back office enterprise applications. Shortly after the original Apple iPhone was launched in 2007 I posted a blog discussing how I thought the iPhone would transform how companies interact with trading partners across a supply chain. Wind the clock forward eight years, no pun intended, and here we are again with yet another device that is set to transform mobile communications, Apple’s Watch. The Apple Watch has received mixed reviews from, consumers, enterprises and analysts and yet the sheer groundswell of companies developing apps for the Apple Watch will certainly make it a success in the near future. 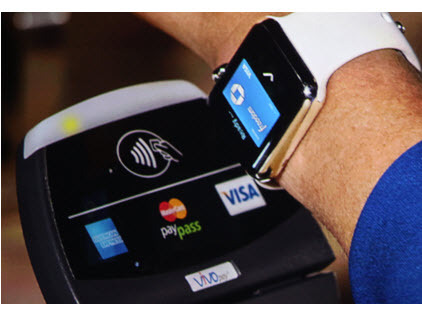 For example one of the biggest uses for Apple Watch will be utilising NFC payments through Apple Pay. The analysts are already making predictions of the technical specifications for Apple Watch 2 and so enters yet another Apple product that will get consumers excited every year when a new version of the Apple Watch appears. I cannot think of any other high tech brand that has been able to build such an expectation for each product launch. From a wearable device point of view, if last year was the year of Google Glass then 2015 will be remembered as the year of the Apple Watch, a device that is going to be receiving the full muscle of Apple’s marketing department to make it a global success. So given everyone is currently trying to define enterprise level use cases for how the iWatch will add value to a business, I thought I would wade in with my own ideas, from a supply chain point of view. 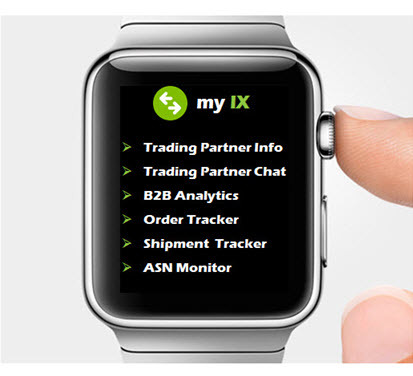 I thought it would be interesting to highlight where I believe the Apple Watch could potentially play a part in interacting with B2B platforms and trading partner communities. I will stress that the ideas discussed in this article are mine alone and not the opinions of my company OpenText and we currently do not have an Apple Watch project of this nature being developed, but in the future?, who knows. 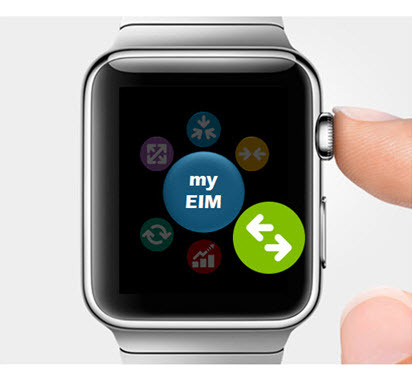 So in the future it may be possible to access our Enterprise Information Management (EIM) suite of solutions, albeit in a very simplified capacity through a wearable device such as the Apple Watch. For arguments sake I will call this ‘myEIM’ to imply that these solutions are being accessed via a wearable device. The icons shown on the screen below represent the key EIM solutions that OpenText offers today, the latest one, through our recent acquisition of Actuate, (highlighted for the purposes of this article by the red icon), is related to analytics. From the main screen I will choose the icon representing the Information Exchange (IX) suite, shown in green, you can see that all other icons are hidden to leave just the one that I am interested in viewing. 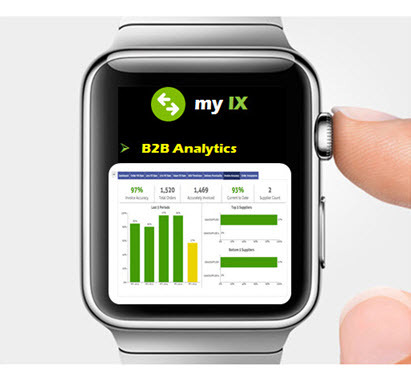 When you select the IX icon you are then taken to the ‘myIX’ suite of tools that relate to B2B and supply chain management. You will notice a number of options from the myIX menu shown below. Let’s briefly review each one in turn. One of the challenges faced by procurement or purchasing teams is having real time access to contact information relating to every trading partner across their supply chain. 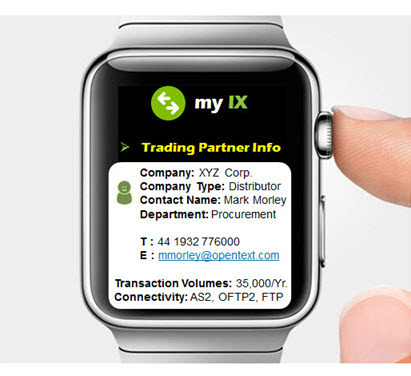 Using information pulled from the central B2B platform it will not only display key contact information but also key information relating to a trading partner’s B2B connectivity. For example how many transactions do they process and which communication protocols do they use. This may seem like really basic information to capture, but when you have a trading partner community of 5000 suppliers, the ability to quickly search through trading partner contacts becomes very important. Once you have found your trading partner contact you may want to initiate a chat session with them to help address a specific issue. 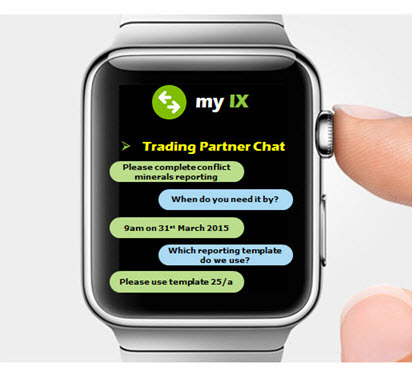 If I had responsibility for managing a trading partner community of 5000 suppliers then I would like the ability to be able to communicate or broadcast to the entire trading partner community through a simple to use chat tool such as this. The concept here is no different to Apple’s iMessage utility for sending short SMS type messages. OpenText recently announced the launch of Trading Grid Analytics to allow companies to monitor all transactions flowing across our B2B Trading Grid infrastructure. (For the record we process 16 billion transactions across our B2B network each year). 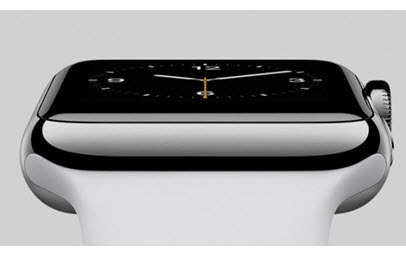 But what if you could review these analytics results on an Apple Watch? OK so the presentation of the analytics based information would need to be highly simplified to make it usable on the Apple Watch but it provides a great way of monitoring key analytics such as transactions by trading partner or transactions by document type etc. The next area where the Apple Watch could be of value, for the purposes of this article at least, is in the area of tracking orders. Knowing the status of purchase orders as they go through the approval process and then being able to track by orders shipped, perhaps by customer location, is incredibly valuable to a company. Any exceptions or errors with an order can be immediately highlighted within the app and the user would be notified of a potential problem by simply vibrating the Apple Watch on the user’s wrist. Colour coding of information based on specific criteria or threshold values provides immediate feedback to the user. 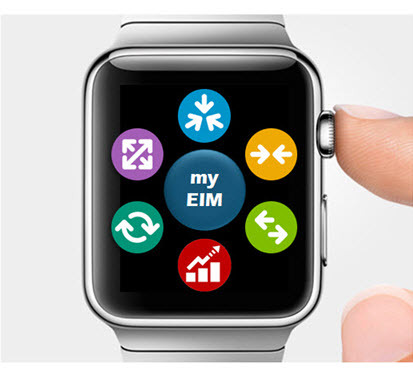 A clear benefit of a wearable device such as the Apple Watch is having access to a suite of highly graphical apps. 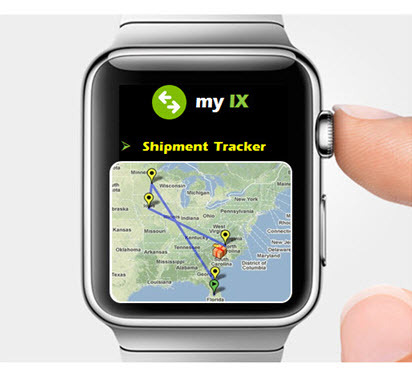 For example simply overlaying shipping/distribution information over a standard map application such as Google Maps helps to give a visual location of shipments and Apple Watch could vibrate as and when a shipment reaches its destination. Clearly you may not want the watch to vibrate for every shipment delivered to a customer, but for high value goods such as cars it could help to ‘enhance’ the logistics management experience. One of the challenges faced by suppliers is ensuring that their customers receive their Advanced Ship Notices (ASNs) on time or within the specific delivery window, for example 15 minutes. Many automotive OEMs rate their key suppliers on their ability to deliver ASNs efficiently as they are critical to the smooth running of Just in Time production systems. In this case you could potentially use the Apple Watch to highlight when ASNs do not get through to the required destination. 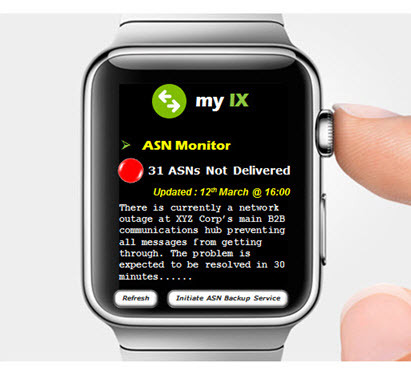 The watch would vibrate to highlight a potential problem and then offer options to address the issue, perhaps launching an alternative delivery method for the ASNs. The key thing here is that you have been notified in real time of a potential problem with an ASN and you can take immediate action to rectify the situation before it impacts your customer’s business. So just a few ideas to get the ball rolling but like all forms of new technology I think it will be a while yet before enterprise IT teams start to fully embrace the power of the Apple Watch.